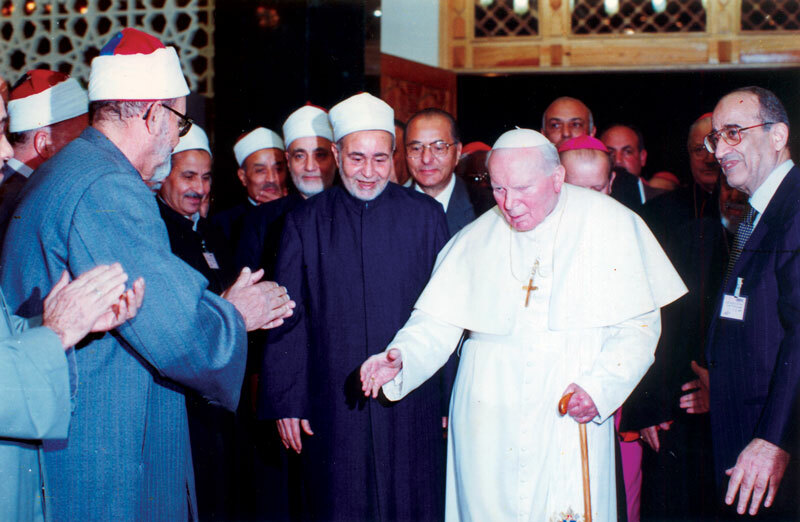 His Holiness Pope John Paul II met with His Eminence Sheikh Mohamed Sayed Tantawy, Grand Imam of Al-Azhar, during the Pope’s legendary trip to Egypt. The meeting took place on Thursday, February 24, 2000, and marked the first time a Pontiff has been to Al-Azhar, or to Egypt. On the eve of His Holiness the Pope’s visit, Sheikh Tantawy reinforced Al-Azhar’s commitment to interfaith dialogue by naming Sheikh Fawzi al-Zafzaf, Wakil Azhar, as Special Representative of the Grand Imam to International Organizations for Interfaith Dialogue. The appointment strengthened Sheikh al-Zafzaf’s role as President of the Permanent Committee of Al-Azhar for Dialogue with the Monotheistic Religions. Additionally, Aly Elsamman, Ph.D., was named Advisor to the Grand Imam for Interfaith Dialogue. Dr. Elsamman also serves as Vice President of the Permanent Committee of Al-Azhar for Dialogue with the Monotheistic Religions. These new positions create a direct link between the Grand Imam and the Permanent Committee for Dialogue thereby ensuring that interfaith dialogue remains high on Al-Azhar’s agenda. The meeting between His Holiness the Pope and Sheikh Tantawy confirmed their commitment to interfaith dialogue by the signing of an agreement that strengthens their already existing relationship and aims at creating a spirit of fraternity, solidarity, justice and peace between Christians and Muslims on many levels. Known as the Joint Committee for Dialogue between the Pontifical Council for Interreligious Dialogue in Vatican City and the Permanent Committee of Al-Azhar for Dialogue with the Monotheistic Religions, the Committee meets every year to issue joint statements regarding timely issues of global concern. The agreement between Al-Azhar and the Vatican was the culmination of four years of negotiations between the two parties. The International Union for Jewish-Muslim-Christian Dialogue and Peace Education (ADIC), under the direction of Dr. Elsamman, was the behind-the-scenes catalyst for the groundbreaking relationship between these two venerable institutions and was supported by Cardinal Franz Konig, member of the Sacred College at the Vatican and President of Honor of ADIC.